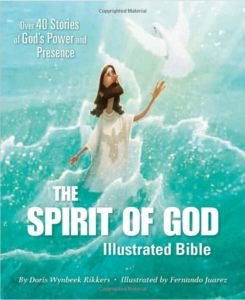 The premise of this book is to tell stories of the Bible with an emphasis on the role of the Holy Spirit in each of the stories. There are a couple reasons why this isn’t as successful as I would have liked. First, It is called an “Illustrated Bible” but isn’t a Bible. It is a children’s book of child-level Bible stories. Everything from Creation to Joseph to David to Jesus to Paul and finally to the child (which I thought was a really great way to end the book.) But if you are going to tell stories, rather than actually illustrate the Bible, it seems incorrect to call this a Bible. It should be upfront. Second, the stories really stretch the participation of the Spirit and attribute to it things it may not have actually done. Look at the first story: Genesis 1. God is seen as creating (good) and then the Spirit is said to make sure that all the stars “stay in place.” I guess you could attribute the fact that all things are held together by God/Jesus and since the Holy Spirit is a part of that it is said to participate. But in Genesis you don’t have the Spirit actually doing that. In the second story, the Spirit is the one that breathes life into Adam. On the other open page (22) you actually read Gen 2:7 where is says the Lord God breathed life into the man. I don’t mean to split hairs here because God is God. But attributing things to the Spirit where the Bible doesn’t seems like a leap I wouldn’t recommend. The art is gorgeous. I love how the Spirit is represented as wispy white smoke that curls around the characters when the Spirit takes action. I like the vast majority of the stories. And I love the ending. Not a bad book, just not what I expected.